We are pleased to announce that S. Elizabeth Bird, PhD, professor of anthropology and Fraser Ottanelli, PhD, professor of history, are winners of the 2018 Book Award from the Oral History Association for The Asaba Massacre: Trauma, Memory, and the Nigerian Civil War (Cambridge University Press, 2017). Their book details the mass killing of hundreds of civilians by soldiers of the Nigerian government, during the 1967-70 civil war over the secession of Biafra. The authors show the importance of the massacre to the history of the war, as well as explore the process of memory over 50 years. The book committee wrote that they were "particularly struck by the strength and rigor of the scholarship, the dialogical use of new media, and the community-engaged approach taken to such a sensitive and traumatic event." The USF professors were honored at the OHA Annual Conference in Montreal. For more information on the book, please click here. Professor Ottanelli also gave a presentation at NYU about the book, which is accessible here. We invite the community to the Third Annual USF History Department Alumni Lecture featuring USF History Department Professor and Acting Chair Dr. Golfo Alexopoulos, who will present a lecture titled "Stalin's Forced Labor Camps: A Re-Examination." The event will take place on October 24 on the USF Tampa Campus in the TECO Room in the Education Building. The lecture will begin at 7:00 pm and will be preceded by a light reception. There will be a Q&A session with Dr. Alexopoulos after the lecture, and you will have the opportunity to meet USF History faculty and students. The event is free and open to the public. Reasonable requests for accommodations should contact Tami Davis at 813-974-2807. For information on the building location and parking, please consult this campus map. Congrats to our alumna, Dr. Brittany Merritt, who just landed a position in History at St. John's University is St. Joseph Minnesota. She beat incredible odds -- with fewer than 15 job listings in Britain/British Empire -- she landed a two-year position. What's the position entail? What's she most excited about? She writes, "I will be teaching the first year seminar (a year-long introductory course for freshmen), the modern European history survey, and upper division courses like "Modern Britain" and "The British Empire." 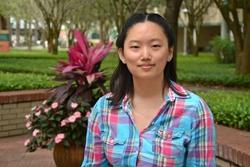 I am most looking forward to working closely with students (since the class sizes are small) and being able to teach courses that are aligned with my research." Congratulations, Dr. Merritt, and best of luck! 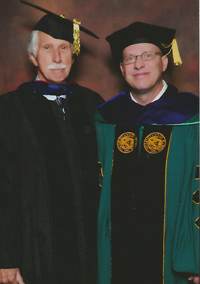 Prof. John Belohlavek and Jason Vickers, PhD '15, at Fall Commencement. 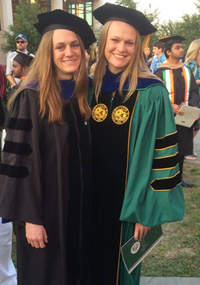 Vickers is the first graduate of USF's PhD program in history. USF History Ph.D candidate Keegan Shepherd has won a Harry S. Truman Library Institute Research Grant to conduct research at the Truman Presidential Library in Independence, Missouri. Keegan will use the award to research federal educational policy during the 1940s as part of his work on the history of standardized testing. As he argues, “the decisions made during the Truman Administration helped make standardized testing a defining feature of modern American life.” Congratulations! The book offers a reconceptualization of the period between the end of the Civil War and the rise of Jim Crow segregation, centered on the changing visions of the South at play in U.S. culture. Examining novels, minstrel songs, travel brochures, illustrations, oratory, and other cultural artifacts produced in the half century following the Civil War, Steve demonstrates the centrality of popular culture to the reconstruction of southern identity, shedding new light on the complicity of the North in the retreat from the possibility of racial democracy. View the Spring 2016 History Department newsletter here!